Benjamin Schreer offers some important qualifications to Radford’s initial remarks about the relevance of Japan’s new carrier, Izumo, both for the JMSDF and in relation to naval developments and ramifications for naval politics in Northeast Asia in general. I think Radford overemphasised, and to some extent misrepresented, the importance of Izumo in the context of Japanese efforts to enhance naval capabilities over the last decade. But I don’t think Schreer is quite right either in his characterisation of Izumo and aircraft carriers, and by extension and the role of a variety of warships in naval operations. Izumo, by design, meets all the established criteria for being called an ‘aircraft carrier’. It doesn’t feature a well deck or other integrated weapons capabilities aimed at providing either amphibious, anti-submarine warfare (ASW), anti-surface warfare or anti-air warfare functions, except for short-ranged self-defence purposes. Just as Hyuga and Ise before it, Izumo is wholly focused on supporting naval aviation. 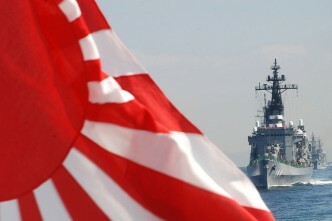 The Japanese designation as ‘destroyer’ can be dismissed as a political choice, as should be done with the Hyuga class. It’s safe to say that in no other naval force worldwide would this term be warranted or used for such a ship. For the time being, the Izumo only carries helicopters in support of what are primarily ASW operations in peer-to-peer warfare scenarios. But this doesn’t by any means negate the capabilities of the design. Neither, for that matter, do Japanese comments to the same effect. The ship before our eyes needs to be judged primarily on its own merits, not by what someone would like to make it out to be for the rest of the world. Nothing in Izumo’s design fundamentally prohibits its use as a STOVL-carrier in the future. Elements such as suitable deck-proofing for use of STOVL-aircraft can be added even during a regular maintenance cycle in dry dock. Schreer notes that Japan wouldn’t procure any aircraft carrier for political reasons. But while Japan clearly walks a fine line between conflict and reassurance, this doesn’t automatically lead to a situation where the choice is between buying nuclear supercarriers capable of striking mainland China and no carriers at all—particularly at a time and in a place where several nations in the region aspire to field a significantly enhanced naval aviation capability. If Japan wanted, the Izumo could fulfil the functions of an ‘airfield at sea’, the ‘hit and run’ task, the anti-ship role and specifically the task of scouting. Assuming, of course, that Japan procures the aircraft required for those roles, most notably a fixed-wing capability with the operational potential of the F-35. While this isn’t an immediate or, in Radford’s words, ‘short notice’ issue, Izumo can functionally assume these roles. Hyuga also provided significant disaster relief functions in 2011. Schreer’s term ‘proper aircraft carrier’ and related choice of examples show why the case of Izumo isn’t nearly as clear-cut as portrayed. For the past six decades the USN’s carriers, have inhabited a niche of naval design not met by any other nation. These ships are rightly called ‘supercarriers’, as they virtually transcend the more traditional view and operational flexibility of aircraft carriers. They also were employed primarily as strike assets against land targets, or as the article puts it, ‘offensive strikes’. This isn’t because this is a real carrier’s primary occupation. 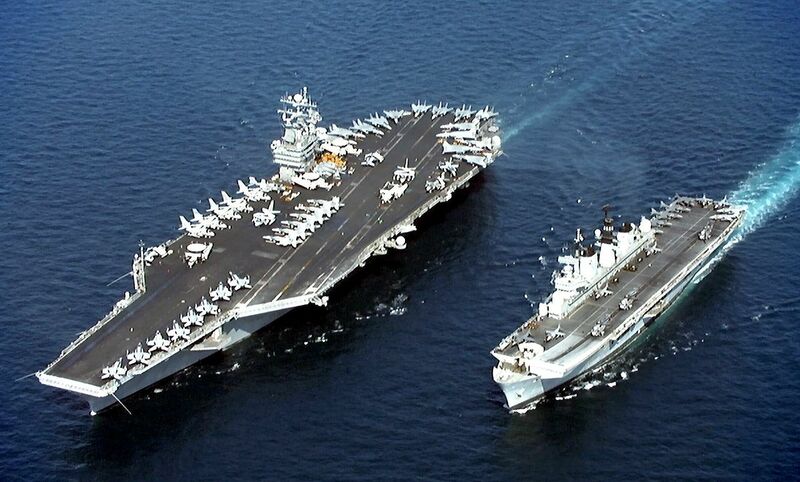 Rather, it reflects the fact that the US hasn’t engaged in any peer-to-peer conflict at sea since WWII. Although France slightly narrowed the capability gap with the introduction of Charles de Gaulle, several nations across the globe carry the distinction of being considered operators of aircraft carriers. They’re able to achieve this without fielding floating air-bases with virtually limitless endurance in the 65,000+ tonnes range. Included here are, of course, the UK and India, two nations who notably have used aircraft carriers with operating designs comparable to Izumo as a decisive capability in peer-to-peer warfare after WWII. Also included is Russia, which, with the carrier Kuznetsov is fielding a fairly dubious carrier capability, as illustrated below. The example of the Chinese Liaoning (which began life as the Soviet-era Varyag), which Schreer includes in his ‘proper aircraft carrier’ group, demonstrates the complex nature of such discussions. While the Kuznetsov class carrier is certainly large in displacement, as a ‘real’ aircraft carrier, it’s much less capable than the smaller Charles de Gaulle. In Soviet doctrine, the function its sister ship Kuznetsov was as a vessel designed to strike at surface ships with its large complement of Granit-AShM missiles. Her deck-layout, hangar-size and choice of aircraft made her naval aviation complement merely a supporting asset to achieve this primary purpose, by providing ASW and local air superiority against an enemy carrier strike group. China has achieved a remarkable feat in not only completing Varyag in a rather short time, but also changing her internal arrangement to some degree. However, the resulting Liaoning still suffers substantially from its very different original layout, when it comes to the ability of ‘real’ carriers Schreer calls for. Nevertheless, the PLAN can claim to operate an aircraft carrier for the first time. 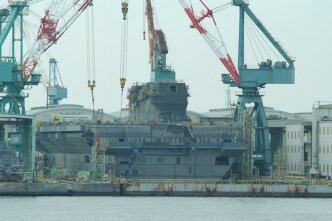 As with the other DDH before it and Hyuga and Ise in particular, Japan is destined to make Izumo the centrepiece, or capital ship, if you will, of its own dedicated fleet, fielding a substantial ASW and disaster relief capability in addition to enhancing its sea control capabilities that have been emerging for two decades now. Alexander Luck is an independent commentator, and holds a Master’s degree in political science and modern history from the University of Leipzig. Image courtesy of the USN via Wikimedia Commons.